Apparently, Kentucky Fried Chicken is suing three Chinese companies for rumor-mongering. About Franken-chickens. 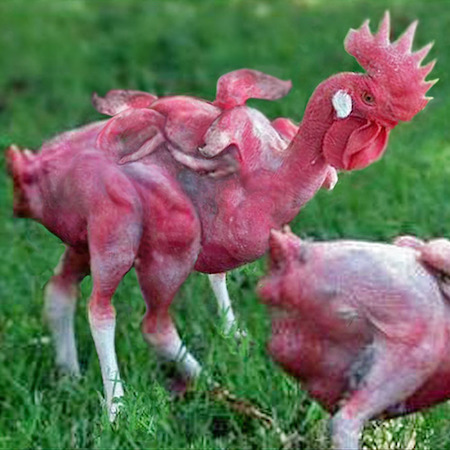 ...KFC is suing three Chinese companies that have spread rumors that the fast-food giant breeds mutant chickens. (Really!) Social media has fueled whispers about franken-chickens that are genetically modified to have six legs and eight wings — for maximum, diabolical meatiness. As KFC's representatives tell it, China's largest restaurant chain has been bullied by three media companies intent on undermining the company's immense popularity. Now, with the support of a government intent on cleaning social media up, KFC can finally fight back, or something! Yum Brands Inc.’s KFC is suing three companies in China for allegedly spreading rumors about the quality of its food, including that its chickens have eight legs, a move that comes as the fried-chicken company fights to regain lost ground in one of its most critical markets. KFC said on its Chinese-language website that three Chinese media companies tarnished its image by spreading false information about its products on social media. KFC alleged in its statement that the companies spread rumors, “misleading the consumer,” on microblogs and through photos and articles that claimed its chicken had six wings and eight legs. The fast-food chain said it is requesting compensation of up to 1.5 million yuan (about $245,000) from each company, an apology and an end to the alleged practices. I have lots more tasty treats in my Science Fiction Foods section - don't miss them!